Each summer, my husband and I spend a week in southwest Wisconsin biking the rail-trails and enjoying the scenic countryside. We also visit local farms, including family-owned cheese producers and organic vegetable harvesters. Our one regret is that we don't live closer to this area, which would allow us to join a CSA, or community-supported agriculture, and enjoy a full season's harvest. What is a CSA? Courtesy of Wikipedia, a CSA is a relatively new socio-economic model of food production, sales, and distribution aimed at both increasing the quality of food and the quality of care given the land, plants and animals - while substantially reducing potential food losses and financial risks for the producers. It is also a method for small-scale commercial farmers and gardeners to have a successful, small-scale closed market. CSA's focus is usually on a system of weekly delivery or pick-up of vegetables, sometimes also flowers, fruits, herbs and even milk or meat products in some cases. Susan Gibbs, of Martha's Vineyard Fiber Farm, wondered about applying the CSA principle on her farm. Instead of the land producing vegetables, how about her lambs and goats producing yarn? And thus began the country's first Yarn CSA. Read the farm's press release below. Martha's Vineyard Fiber Farm to Offer Shares of "Farm Fresh Yarn"
Martha's Vineyard- Plans were unveiled today for the first-ever "Fiber CSA" where knitting enthusiasts can purchase membership shares in the Spring 2007 "harvest" of fiber from the angora goats and fine wool sheep of the Martha's Vineyard Fiber Farm. Purchased for yourself or as a gift, share ownership lets members become "vicarious shepherds" without ever having to feed a sheep or shear a goat. 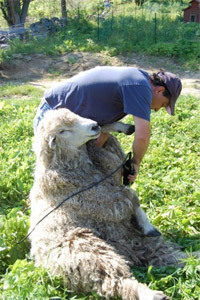 Best of all, after shearing, each member will receive an equal portion of the clip in the form of unique, one-of-a-kind yarns. A CSA is a relationship of mutual support and commitment between local farmers and community members who pay the farmer an annual membership fee to cover the production costs of the farm. In turn, members receive a share of the harvest. This arrangement gives the farmer a direct connection to and relationship with the consumer. The CSA concept is quietly sweeping the country with families who are looking to help small farmers stay profitable while taking advantage of all the benefits of buying local. The idea for a "Fiber CSA" is the brainchild of Susan Gibbs, who began her career as a television news producer and freelance magazine writer, but fell in love with farming and the idea of creating a connection with consumers and the land. "My boyfriend and business partner and I have had success with raising sheep and goats for their wool and mohair. We started getting requests for yarn made from the fiber from one particular sheep or goat that they'd seen on our website or during a farm visit. They wanted to have a connection with these amazing, gentle animals. A Yarn CSA seems like the perfect way to make that connection." Why Martha's Vineyard? "We love the Vineyard and its people, so we started to experiment with raising animals in an island climate and we were curious about what the effect the sea air. The yarn we've produced is buttery soft and luxurious. We moved our herd to the Island to take advantage of the mild weather and quality of forage that allows for superior fleeces." A limited number of shares will be pre-sold at $100 per membership share. Shareholders can choose to take all of their share of the harvest in one type of yarn or receive a sampler pack that includes mohair, kid mohair, Cormo, Cotswold, and fine wool yarns. 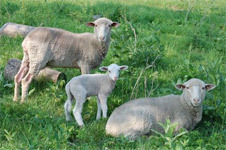 The purchaser will receive a shareholder's certificate, weekly email updates on the animals and farm, and an invitation to the farm's Shearing Day Celebration. 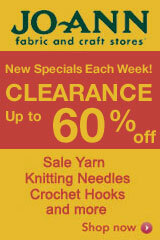 For more information, or to purchase a share while they last, visit our website at marthasvineyardfiberfarm.com.